Date: Monday, 18 September 2000, at 3:37 p.m. If you were a fan of TVB's Gu Long novel adaptations of the 1970s, then the name of actor Wong Yeun Sun should be familiar to you. Wong Yeun Sun brought to life several of Gu Long's most well-known and well-loved characters, incluidng LUK SIU FUNG's Sai Mun Chui Sheut, THE TWINS' Little Fish, and LITTLE LEE'S FLYING DAGGER's Ah Fei. Those unfamiliar with Wong Yeun Sun's work may be wondering who he was, and whatever happened to him. Wong Yeun Sun got his start in the early 1970s as a stuntman/extra for the Shaw Brothers' famous martial arts films and the fledgling TVB. By 1975, TVB's casting directors had discovered that in addition to his deft acrobatic and martial arts moves, Wong Yeun Sun also had solid acting skills and a commanding on-screen presence. 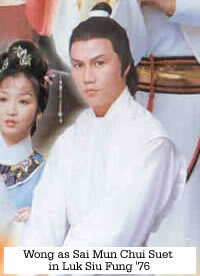 Thus, when it came time to cast LUK SIU FUNG (which was only TVB's third foray into making a martial arts drama), Wong Yeun Sun was selected to portray the Sword God Sai Mun Chui Sheut. Wong Yeun Sun played the role to perfection, capturing the essence of Gu Long's original character. It was a performance that would go down as a classic and would pay big dividends for Wong Yeun Sun over the next few years. In the second half of the 1970s, Wong Yeun Sun was on the short list of TVB's A-list of male actors, which at the time also included Adam Cheng Siu Chou, Damian Lau Chong Yan, Patrick Tse Yin, Chu Gong, Sek Sau, Wong Wun Choi, and two up-and-coming youngsters named Chow Yun Fat and Simon Yam Dat Wah. Following up on his success as Sai Mun Chui Sheut in LUK SIU FUNG (of which there would also be a successful Part II -- THE DUEL and Part III -- THE BATTLE OF MO DONG), Wong Yeun Sun went on to play Little Fish (Siu Yu Yee) opposite Sek Sau's Fa Mo Keut in THE TWINS, and would star opposite Chu Gong's Lee Chum Foon in LITTLE LEE'S FLYING DAGGER (Part I and Part II - DEMON'S SWORD, HERO'S PASSION) as swordsman Ah Fei. Wong Yeun Sun also had major supporting roles in several modern dramas during the time, and while these roles did not suit him as perfectly as the "dai hup" (heroic) roles in martial arts dramas, he played them effectively. By the late 1970s/early 1980s, Chow Yun Fat Mania had set in thanks to the success of such series as HOTEL (1976), THE MAN IN THE NET (1979/1980), and THE BUND (1980). The late 1970s and very early 1980s saw TVB temporarily shifting away from mo-hup dramas in favor of modern dramas and early-20th Century Shanghai mob dramas. Older stars such as Adam Cheng and Wong Yeun Sun began slipping from TVB's A-list as younger, more versatile actors like Chow Yun Fat, Simon Yam, Ray Lui Leung Wai, and even the fledgling Five Tigers (Kent Ton Jen Yip and Felix Wong Yat Wah were already getting their first lead roles by 1981, and Andy Lau Dak Wah, Miu Kiu Wai, and Tony Leung Chiu Wai were either playing extras as fresh graduates out of TVB's acting academy or training in the academy) ascended to the front of TVB's ranks of actors. In 1981, Wong Yeun Sun did play the lead opposite Ray Lui Leung Wai's Ding Lik in THE BUND Part III, but this series, despite being a solid drama, was largely overshadowed by the famous original series. Wong Yeun Sun also made a low-budget few cop/crime drama movies at this time, which were not particularly well-received. In 1981, Wong Yeun Sun left TVB for rival station RTV (soon to become ATV in 1983). There, he had one last hit as the title character in MASTER FOK YEUN GAP, which became an RTV classic. From that point on, Wong Yeun Sun's star continued to fade. He would act intermittently in ATV dramas for the remainder of the 80s, but he was clearly no longer on the A list of Hong Kong TV or movie actors. One of his last performances was for an ATV Qing Dynasty drama during the late 1980s, in which he turned in a fine performance as a Qing emperor. In 1990, his acting career in tatters and his personal life in turmoil, Wong Yeun Sun left the Hong Kong entertainment business and became a Buddhist monk. He later emigrated to the United States. In 1997, Wong Yeun Sun re-emerged from the Buddhist temple. Deciding that the life of a monk wasn't for him after all, Wong Yeun Sun rejoined the secular world. He declined to return to Hong Kong to rekindle his acting career, however, and was last known to have been employed as a successful automobile salesman in California. Thanks alot to Ken Cheng for the Luk Siu Fung pictures as well.